This article, published in the Journal of Microfinance, highlights the effects particular impacts that microfinance programs have on childhood education. Using data from a south India household survey, the article examines how microfinance impacts schooling and literacy, how credit enters the household, and who brings it in. Regression results show that in the case of direct bank-borrower credit delivery, it does not matter whether credit enters the household through the mother or the father. However, large differences occur when mothers obtain credit through women's groups. Analysis indicates that combined financial and social-group intermediation leads to higher educational inputs and outputs, mainly for girls. 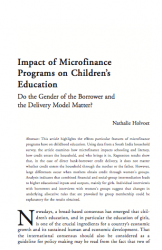 Impact of Microfinance Programs on Children's Education: Do the Gender of the Borrower and the Delivery Model Matter?